As a small child, I used to enjoy watching the rain drops fall from the roof top in to the collecting water, make small bubbles that burst with a small ‘pop’, making concentric circles that travel outward to collide with countless others before disappearing in to the water. By then, several new drops arrive and the process goes on and on without an interruption. As I simply watch this for a while, something strange used to happen. There was a strange feeling of peace and joy and there was nothing but the continuous birth and death of water bubbles, countless circles and the distinct ‘pop’ sound. There used to be several small black ants that are caught up the sudden downpour, frantically swimming away to safety. The ant was definitely not enjoying this as I did. That thought made me feel different to be watching the whole thing as is, not affected by it. Strangely, watching these rain drops used to bring a sense of detachment in me; that I did not really bother to rescue the ants. There was something serene and divine about this. If there was someone above who was watching over us, the humans, running around stressed, fighting, cheating, trying to find happiness, chasing fulfillment… wouldn’t he also have the same sense of detachment that I had? 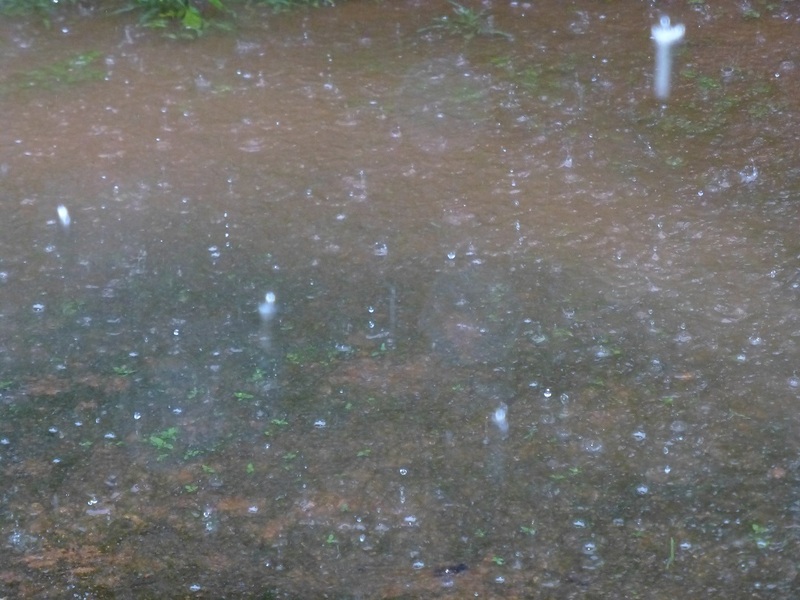 After a very long time, I was in my hometown last month sitting in the verandah and watching the falling raindrops. At first it brought back the strong memories from my childhood and soon I lost myself again in it. Quite some time should have passed, when it occurred to me that it must have been very long that I indulged in something so trivial and useless; thanks to the industry that I am part of and the fast world that I live in. The serenity was there, the peace was there and I was lost. I remembered this today as I watched this TED video the_world_s_most_boring_television_and_why_it_s_hilariously_addictive. This is about the world’s most boring television show and the concept of slow TV. This talk was delivered by Norwegian television producer Thomas Hellum who is behind some of famous ‘boring’ programs aired by the NRK Television. They did shows around very trivial things such as a live telecast of a 7hr train journey (three cameras –one at the front and one each at each side – There was no story, no commentary, just whatever the camera saw and heard), an18 hr fishing expedition and a 5.5day ferry voyage. The Norwegian president appears in the video stating that he has been glued to his chair for 5.5 days (btw, he is 82).Thomas Hellum says that they are planning to live telecast many such trivial things such as knitting, cooking etc etc. There is something very beautiful about this. They are showing things as is and you see something as is, real time, with nothing to expect, nothing to logically process. If you can overcome the initial barrier of judgment and rejection, something wonderful happens. You begin to thoroughly enjoy and at some point all the noise in the head begins to settle down. And every great religion has told you how nice it feels when that damn noise stops. This is like a new age zen and I believe increasingly there is an absolute need for people to fully engage in something that is trivial, of no use as such, logically unconvincing…This might probably be the next booming industry, a technology powered zen at a very large scale. This will be the new religion and spirituality of the world. afterthought: I watched the film PK over the weekend. If you compare to all the great ‘alien’ films, this alien was terrible. The alien here looks like any of us, talked Bhojpuri Hindi, ate Samosa’s, feel jealous when he learns that heroine was in love with someone else..The film is one of the biggest hits in the history of Bollywood, I think primarily because there is not much of logic in there. Once the great burden to ‘understand’ is not there, there is real enjoyment. This entry was posted in Mind, Mindfulness and tagged Attention, Awareness, blank mind, Consciousness, Logic, Meditation, Mindfulness, nothingness, pure perception, thinking mind, Zen on January 13, 2015 by Sajeev. I had a strange dream last night. There was this girl in the dream who was possessed and I was there to exorcise the spirit. The dream was set in a kind of somewhat unfamiliar environment – there was a building with many houses in a row and we were doing this in one of the rooms on the first floor. I remember having done the exorcism (with some reluctance); but cannot recollect anything post that as the dream ended somewhere there. A friend of mine had rung me up in the evening – he had wanted me to talk to his 7th standard daughter, who seemed to have become uninterested in anything. I advised him to take her to a child psychologist – but he pressed me to have a conversation with her first. I wasn’t sure if I wanted to do this – at the same time I could not refuse his request. Reflecting on the dream, it was evident that this incident was what lead to it. But what I could not figure out was the part with exorcism- where did that come from?. As I was pondering about it during my drive back home in the evening, the whole thing dawned on me and I couldn’t but be amused at what’s going deep inside the mind. In the evening, I had watched some part of a film called ‘Resident Evil- Part 2 apocalypse’ on the television for about half an hour while I was on the treadmill. I saw the part where the character Alice escapes from the ‘Hive’ and is caught again and to the point where ‘Operation Alice is activated’. I didn’t quite get the whole story, but sort of figured out that Alice was being programmed to be evil – something like that. Alice’s daughter appears in multiple scenes and there was this scene where she asks Alice if she would be alright again. Now in the dream I connected these two together. And what was the connecting link ? – The child, that was common between the incident and the dream. And why these two specific incidents – because both of them were sort of incomplete. In the case of my friend’s daughter I was in a dilemma whether to do it or not and in the case of the film, I did not understand the story. Imagine something like this – everyday while you are asleep, all the unresolved / incomplete things precipitate in to the unconscious mind (who obviously do not like anything unresolved) and it tries to make sense of them. If that’s what dreams are made of, then what’s it that this world is made of? This entry was posted in Mind, Thinking and tagged Dreaming, Dreams, How dreams are made, Mind, Sleep, Unconscious mind on July 27, 2014 by Sajeev. Compulsive thinkers have a tough time meditating. Better you are at thinking, harder it is to let go off it. I have had this problem ever since I started meditating. What typically happens is something like this: I sit down to meditate and watch my thoughts. There are thoughts running and as I watch them, I come across that brief interval between them. For a moment, it looks like I am getting it. Wrong. Unobserved, there is this voice at the back of my head that says ‘It’s working, the gap is there’. Then there is another part of the mind that’s watching this and he says ‘Not yet, that’s a thought there’. Now there is another part that is analyzing the whole situation and says something like this – this isn’t working for you. Then I remember something I read about meditation in a book and a part of my mind commenting that it’s not all that correct. Then I realize that I am again caught up in thinking. I let go off thinking again and again get back to being the ‘watcher’. And the struggle goes on and on, with some success after few iterations. They say during meditation, you have to be like a gatekeeper. Watching every thought that comes in. But I realized that my mind was something like a house with several doors and windows. While I am watching the front door, there were thoughts entering through the backdoor and windows. They just needed that split second where my attention was elsewhere. While these sessions did help me get some insight in to the working of the mind, it has always been a challenge to be free of thoughts. In olden days, people had not-so-much complicated minds as we do and it would have been easier for them to watch the mind as a single entity. But people like us whose primary occupation is thinking, have much more complex minds with several distinct faculties. Most of our lives are made of thinking and it’s hard to drop it – it’s like dying. Over a period of time, I could see that these thoughts were not just random, but had some specific purposes behind them. For example, some thoughts were about planning, somewhere concerned about making sense of something happening in life, somewhere concerned about some dreams in the future etc. So it was like there were some little entities in the mind with certain purpose/objectives and they were responsible for specific thought patterns. They together made up the mind. So if I were to really watch my mind, I should be watching each of these entities first and when each of them becomes quiet, I would be a step closer to a silent mind. But how do we do this? I devised this meditation technique – Naughty Children Meditation- which is an improvised version of existing technique of watching the thought stream. The Bear – This is an odd one in the lot. This is that entity that tightens your body when unobserved. The first thing to do is to familiarize with each of these entities. Each of them have a specific purpose and all the thoughts that arise can be traced to one of these. (It’s likely that you may want to add your own entities in to the list – like Regretter – One who regrets some actions in the past. Imagine that each of these entities are like little naughty children in a class room. They are sitting in front of you (visualize), and you are simply watching them. They are so naughty that they will talk the moment your attention is not on them. But if you catch them, they remain silent. At the same time, they are small little children and if they are caught, you are not going to punish them. You are going to simply laugh (or chuckle or smile) when you catch them talking. So this is what you do. Sit in your favorite meditation posture and imagine that you are watching these little naughty children, who are sitting in front of you. Now when a thought comes, identify the naughty entity behind it (compare it with children taking). For e.g. if the thought is regarding something that you need to do, then it comes from the planner. Notice it (look at him) and laugh (or smile). The next thought, say is a commentary about what just happened in the mind. You know it is from the Commenter. Just watch him and laugh and leave. Just keep doing this. When you look at them, they become quite. You might also sense some tightness in the body – this is the work of The Bear. Just watch him and smile and he will let go off his grip. Very soon, a these naughty children will become quite while your attention is placed on who is ‘talking’. Then something profound happens, the whole mind stops or vanishes and you transcend the mind, so to say. Meditation is supposed to be effortless, while there is some effort involved here. But that effort is only meant to overcome the initial difficulty that you face. You are watching the mind not as a single entity, but as different entities that does different things. This helps because then the thoughts cannot enter through the backdoor, unnoticed. Once a these entities are silent, the whole mind is silent and then onwards it is effortless. Remember, playfulness is the key here. Visualizing these entities as little naughty children is extremely important; it’s like a game that you are paying with them. And you do not react, you smile at their naughtiness. Laughter or Chuckle or Smile creates that little gap that you need not to get caught up in the thinking, but to be able to watch it. One problem that you might find is to identify these entities precisely. Do not worry about it, start with a few that you can figure out. Read through the list carefully again and you should get it. It does not really matter if you make a mistake, the whole objective of meditation is to transcend the mind and it does not matter what the content of the thoughts are and where they come from. Let this not deter you from making an attempt. Initially you will need to do some sitting practice. Once you get a hang of it, you will catch those little ones in your daily lives. When you get angry at someone in traffic you will know that the ‘Reactor’ is talking and that awareness is enough to silence him and that smile is enough to transcend it. Try it for yourselves. God bless. This entry was posted in Mind, Mindfulness, Patterns, Thinking and tagged Awareness, Meditation, Mind, Mindfulness, Thinker and watcher, Watcher, Watching the mind on June 29, 2014 by Sajeev. I had stopped at this small roadside shop for a coffee and a smoke. As I was waiting after placing the order, my attention was drawn to a gentle nudge on my right leg. It was very distinct, but also very gentle. I looked down to face a dog with its eyes fixed on my face intently. It was silently telling me ‘buy me something to eat’. It was a very clear communication and there was no mistaking. I bought a packet of biscuits and offered him. He ate them briskly, gave me a look of ‘thanks’ and moved on to another person. I have seen trained dogs do all kinds of things like picking newspapers and even do some shopping. But they are always doing something repeatedly and I never thought there was so much of intelligence in it. 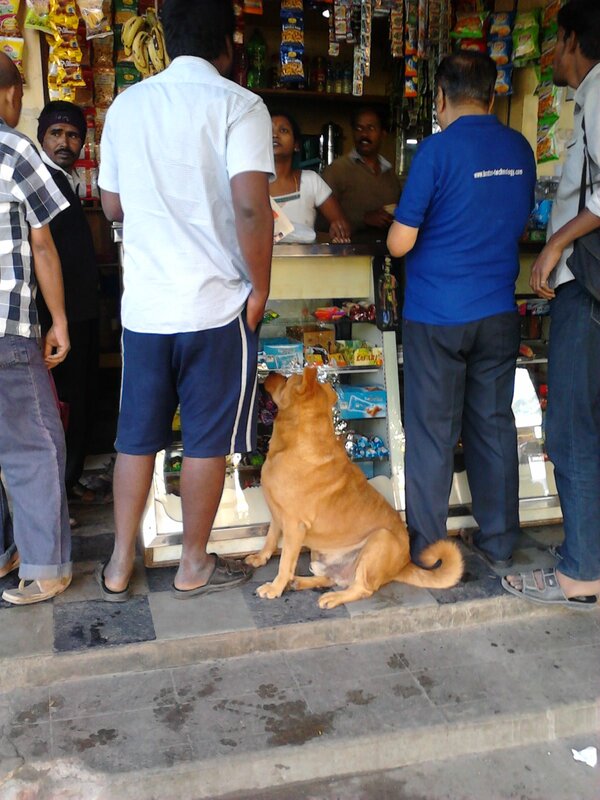 But here was a stray dog, healthy (you know why) and it had learned exactly how to communicate with humans. Did someone teach it ? very unlikely. My best guess was that it saw some children persuade their parents to buy them something. This entry was posted in Life Around, Thinking and tagged Intelligence, Intelligent Animals, Intelligent dog on March 9, 2014 by Sajeev. Bangalore is a riot of colours in Spring. 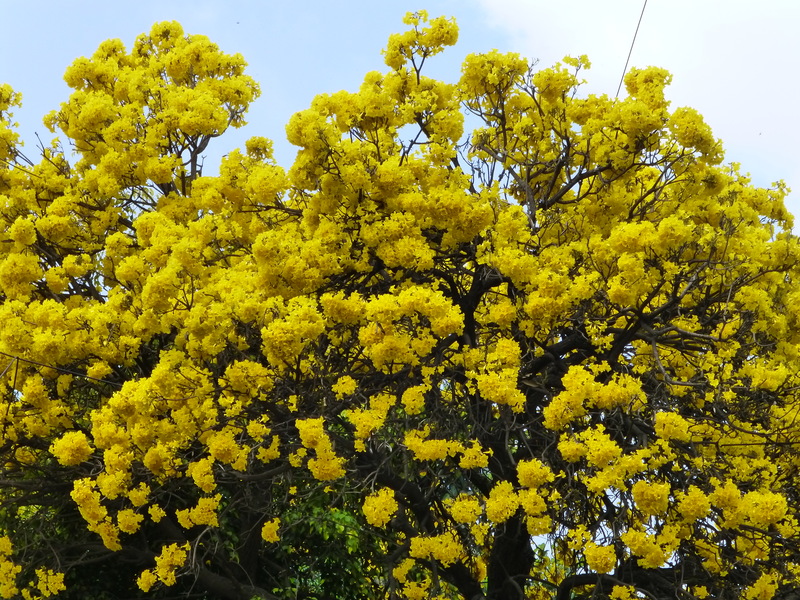 Here is a Yellow Tabebuia (Caribbean Trumpet) tree in full blossom near my home. While I was returning to my car after taking this photo, another Tabebuia tree on the other side of the road caught my attention. 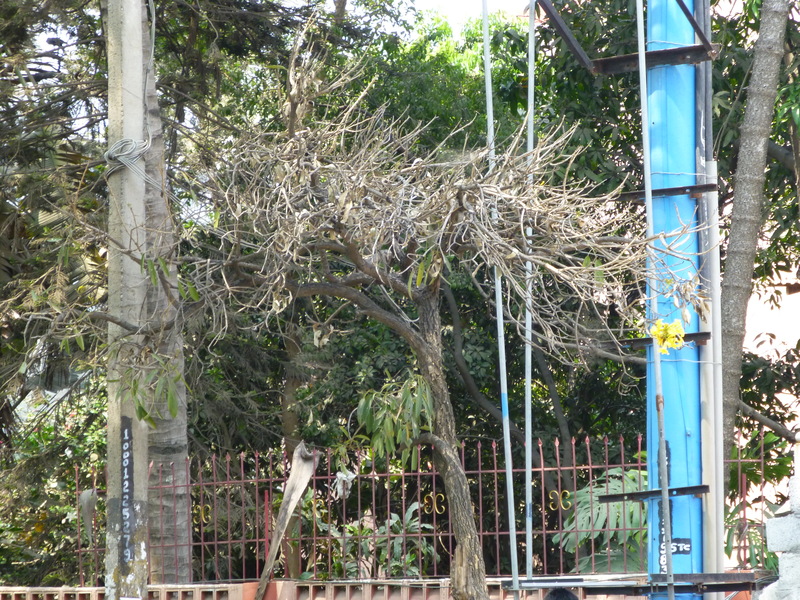 It is a victim of the ‘beautification’ drive in the city. They had concreted the pavement where this tree stood depriving it of everything needed to survive. The branches had dried, leaves gone and its imminent death was visibly very close. 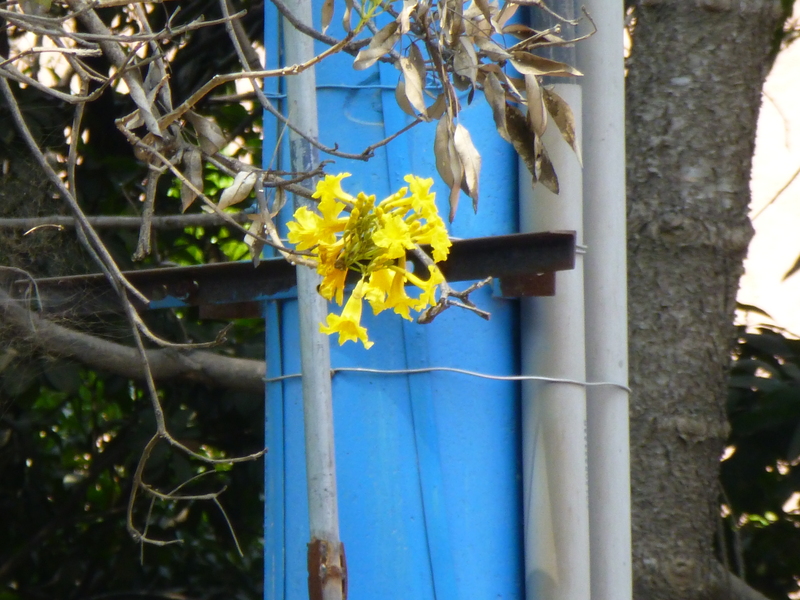 Even then, there was this single bunch of flowers that it proudly bore on one the last green branches. I assume the tree knew of its fast approaching death, but that in no way did diminish its enthusiasm to express itself the best possible way. It was saying silently to the humans – you can kill me, but not my spirit. This entry was posted in Life Around and tagged Caribbean Trumpet Tree, Flowersin Bangalore, Spirit of expression, Spring in Bangalore, Undying spirit, YelloTabebuia bloosoms on March 2, 2014 by Sajeev. 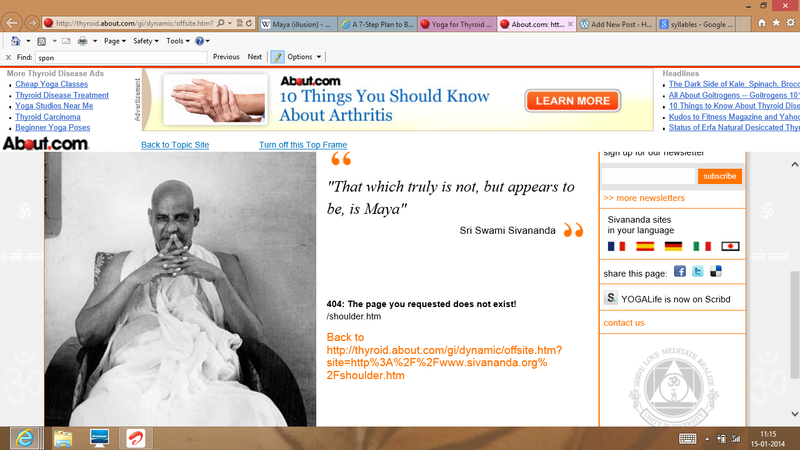 What better testimony could I have for the quote : The webpage appeared to be there, but was not in reality ! Postscript: In Hinduism, three two-syllable words – Maya, Leela, Karma – explains pretty much everything. What happens to you beyond your control is Karma, what happens around you without your involvement is Leela. When you were involved and suddenly realize that you are not involved, that’s Maya. While an understanding of these potentially liberates a person, the beautiful contradiction is that they can be used as excuses to cover-up anything in life ! This entry was posted in Culture, Life Around and tagged Hinduism, Karma, Leela, Maya, What is Maya on January 15, 2014 by Sajeev. What you see in the picture is a dust cover of a book lying on the floor of my living room. It’s such a trivial thing to attach any importance to. Even I did not, until this evening, which was the third day that it had been lying there. It caught my attention when I returned from work. The irritation I felt lasted only a brief moment and gave way to amusement as the complexity of what lead to it unfolded in my mind. I should give you a bit of background first. My wife, my 10-year-old daughter and I live in this apartment. A very clear division of responsibilities exist in our house, which has evolved over a period of time. My wife takes care of all matters at home (though with lot of complaining). I take care of my office work and things outside of home. My daughter lives in her own world of books, games and TV, never crossing her self-drawn boundaries. My daughter and I are extremely unorganised. We love to scatter things around and literally litter the house. My wife loves to keep the house neat and tidy and we now take it for granted that it is her responsibility to put things in order. This works most of the time, except on few occasions where she feels she has had enough. My daughter and I are voracious readers. I keep buying books for both us and the result is an overflowing library at home. My wife thinks I am wasting money buying books and keeps gives me a nasty look whenever I do. Now back to the dust cover lying on the floor. It had been removed from a book and kept in the book shelf. 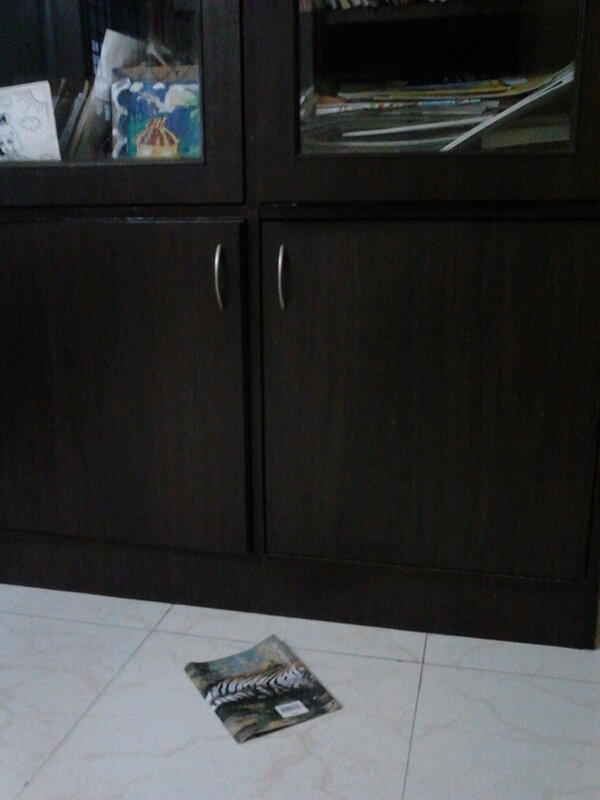 It must have fallen down (most probably) when my daughter was taking a book out of the shelf. She must have never bothered to put it back, for she considered it was mother’s job to put things in order. My wife must have had enough of this and decided to leave it where it was (books belong to father and daughter and they better learn to take care of it). I come home in the evening and notice the dust cover lying on the floor, but do nothing about it (who ever let it fall should put it back). No questions asked, no words spoken. All of us went about with our regular affairs; except that none seems to take notice of the dust cover lying on the floor. The next morning I left to office and my daughter to her school. When I return in the evening, the cover was lying there still. Our maid servant was on leave for a few days and I assumed that the house wasn’t vacuumed or mopped. Another night passed with the dust cover still lying there. I think each of us now where expecting someone else to lose their patience and do something about it. On the third day I returned home to find the dust cover still lying there and I also saw that it was deliberately left there (the floor was vacuumed and mopped !). It was when the whole drama dawned on me and I couldn’t help being amused at the complexity of it. I picked up the dust cover and put it back in to the book shelf. Everything around us, whether important or trivial, in order or out-of-order, on time or delayed, isn’t there or there without a reason. They have complex human egos with hundreds of concepts, playing elaborate games behind the scene. We are such stuff as dreams are made on, said Prospero in Tempest. But I am sure our lives are made up of such concepts that we are not even aware of. This entry was posted in Ego, Mind and tagged Concepts, Concepts in the mind, Ego, Ego games, Human relations, Mind, Mindfulness, Self, Unconsciousness on November 24, 2013 by Sajeev.